When we think about aquatic invasive or non-native species these days, we often think of Asian carp moving north towards the Great Lakes or zebra mussels spreading across state waterways. The spread of invasives in Wisconsin waters might seem like a recent phenomenon, but non-native species—whether intentionally stocked or accidentally introduced—have been with us for over a hundred years. Many of these non-native species were intentionally introduced in the hope of benefitting industry and recreation. Others have hitchhiked their way into our lakes and streams with significant adverse consequences. Take the zebra and quagga mussels, both of which arrived from the Baltic Sea in the ballast water of ocean-going ships in the late 1980s. These two seemingly benign life forms (a mussel doesn’t exactly conjure terror or panic), with their prodigious appetites for small plankton and their blanket coverage of surfaces, have likely so altered the food web of the Great Lakes that the waters can no longer support the abundant populations of commercial and sport fish species upon which the economies of Wisconsin’s coastal regions were built and today depend. Sometimes what begins as a somewhat benign species becomes burdensome after its population uncontrollably grows. A good example is the common carp, introduced to U.S. waters in 1895 to serve as food for a burgeoning population. These fish were easy to rear in aquaculture—the controlled farming of freshwater or saltwater plants and animals—and hardy enough to survive the arduous railroad journey across the U.S. in barrels. Had early fish managers known the environmental damage these fish would later wreak, it’s doubtful they would have stocked them. The problem came when the carp moved from captive ponds and into lakes and rivers. Carp find their food on the floor of waterways, rooting around in search of bottom-dwelling invertebrates. Their foraging dislodges plants, allowing sediments to become suspended in the water column and reducing water clarity. When the population of carp explodes in a particular body of water, the constant stirring of the bottom prevents the reestablishment of rooted vegetation—a crucial element to a healthy aquatic system. 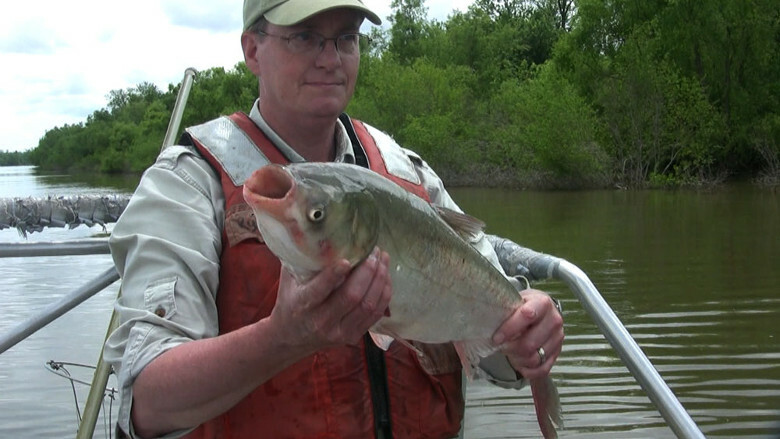 Recently, Asian carp have received a great deal of press. Asian carp (as the name implies) are originally from Asia, but the term is also a catch-all for four particular species of carp: grass, black, bighead, and silver. Each species has different feeding habits or forage preferences with concomitant ecological consequences. Grass carp eat rooted aquatic plants and for this reason have been successfully used to control excessive vegetation in ponds. In the wild, however, they may damage native or desirable plants that serve as important nursery habitat for young fish. Black carp eat mollusks and are used in aquaculture ponds to control snails that harbor the parasites which can infect catfish and make their flesh unsightly (and thus unsellable). Unfortunately, these fish are not selective in their feeding and in the wild will eat endangered fresh water clams or snails. Bighead and silver carp were brought to the U.S. in the 1960s to early 1970s to help maintain and improve water quality in southern U.S. catfish ponds. Silver carp consume algae, a frequent by-product of the high nutrient levels in aquaculture ponds. For fish farmers, it was a win-win situation: the silver carp helped maintain water quality and provided the fish farmer with another harvestable product. What they didn’t count on was that bighead carp were probably mixed in with the original shipments of silver carp—and that both species would escape. In the closed environment of a healthy aquaculture pond, silver and bighead carp cannot reproduce; their numbers are tightly controlled. Unfortunately, fish farms—especially catfish ponds—are often located in low-lying areas prone to flooding. When a fish farm floods, there are obviously no fences to contain the fish, and they can escape into the wild. Bighead and silver carp were released either through flooding of fish farms or they may have been stocked in reservoir systems by well-meaning state or federal fish managers. Either way, once introduced the fish quickly became established in the Mississippi River and began their trek north toward the Illinois River. Though both silver and bighead carp began to appear in low numbers in central Illinois about 1997, their abundance did not reach the phenomenal populations we see today until 2000. The fish have passed through twenty seven navigation locks on the Mississippi River since their original introduction and through seven locks on the Illinois River and Chicago Sanitary and Ship Canal. The Illinois River in central Illinois supports the most robust population of Asian carp in the U.S and perhaps the world—even more dense than in their native countries where their populations have been suppressed by overfishing. Today, all we can say with certainty is that these two invasive species came from the southern portion of the United States and that they are now nearing—or are in—Lake Michigan and threatening to become established in all the Great Lakes. These large-bodied carp, which can reach a hundred pounds or more, became established in the Mississippi and Illinois Rivers in part because these fertile, plankton-rich waters provide the foods they need. Silver and bighead carp are filter feeders, pumping water over extremely fine “rakers” on their gills. Packed together like teeth on a comb, these rakers strain out small particles of plankton and fine bits of organic matter. Unfortunately, this means that bighead and silver carp are feeding on the same plant and animal food that supports invertebrates and the early life stages of desirable sport and commercial fish species. Thus a large population of silver and bighead carp can easily compete with and adversely affect fish populations in the Great Lakes and regional tributaries. Though zebra and quagga mussels have already significantly altered the Great Lakes food web by filtering and consuming much of the tiny plant and animal plankton from the water column, it is likely bighead and silver carp will still find enough to eat in these vast bodies of water. Asian carp are quite flexible in their foraging habits; in one large Hungarian lake, the fish have been able to thrive on zebra mussel larvae. It is also likely that the fish will do quite well in productive near-shore areas, drowned river mouths, and shallow bays such as Saginaw Bay, Green Bay, and the western end of Lake Erie where waters are rich with algae and other plankton. If we are to combat the bighead and silver carp, we need to better understand how they spawn, develop, and grow. Like the salmon and trout that are stocked in the Great Lakes, bighead and silver carp are lake fish that swim up tributaries to spawn. The impulse to spawn is usually in response to a flood pulse, the seasonal flooding of relatively flat, low-lying areas adjacent to major rivers. The adult carp migrate long distances upstream, and spawn in large groups below an obstacle such as a falls, dam, or in areas of relatively high current velocity. These fish are highly prolific; a forty-pound female can produce over two million eggs in a single season. The semi-buoyant eggs are broadcast into the turbulent water and are fertilized externally. After fertilization, the eggs begin a hundred-hour journey, floating downstream with the water current. The eggs hatch after about thirty hours and the larval carp continue to float with the current for another sixty to sixty-five hours. About 106 hours after fertilization the larvae are able to swim to the side of the river in search of a quiet channel or fertile backwater area in which to grow. The combination of extremely fertile waters and right channel size in the Illinois River allows the young carp to quickly grow large enough (about eight inches) that they are no longer vulnerable to many predators. While the Illinois River might be a perfect nursery for young carp, their required float time and their need for a relatively large river for spawning may limit the fish’s ability to find a home in the Great Lakes. Without adequate current velocity to keep the egg suspended in the water column, it will sink to the bottom to die or become dinner for a predator. Based on accounts of where the fish thrive and reproduce successfully, it seems they need large rivers with about sixty miles of broad, open channel to spawn. A cursory review by the U.S. Geological Survey (USGS) in 2005 of Great Lakes tributaries indicated there may be twenty two tributaries with sixty miles of open, main-stem channel on the U.S. side of the Great Lakes. The USGS is currently more closely assessing the suitability of these Great Lakes tributaries as spawning habitat. Knowing which rivers possess enough water volume and current velocity to provide a suitable nursery habitat for Asian carp will help direct future management and control efforts. Another factor that could influence the carp's ability to become established in the Great Lakes is temperature. Though the native range of Asian carp extends from Siberia in northern Asia all the way down to temperate Vietnam, the cooler temperatures of the Great Lakes latitudes could slow the rate of larval development and require even longer “float time” for the eggs—and thus longer spawning rivers— for successful reproduction. With cooler water contributing to slower growth and maturation, young carp would become more vulnerable to predators. Many of us have seen the astonishing photos and videos of jumping silver carp in the lower Illinois River. In some instances the fish can be seen falling—quite literally—like rain on the surface of the river, at times even landing in boats. We can all recognize the potential physical danger these fish pose for recreational boaters. When disturbed by the sound of a boat motor, silver carp can leap from the water and slam into boat passengers or people riding jet skis. Perhaps more troubling than the recreational threat these fish pose is their full-scale invasion of a particular region. Where silver carp have displaced native fish, commercial fisheries are forced to switch to a new and largely undesirable species. Besides the fact that the price per pound for these fish is low, the commercial demand for silver carp is not currently sufficient to support more than a few fishermen. If demand increases (as it did in Asia), commercial fishing could help reduce the abundance of the silver carp in the Illinois River. For now, it is this over-abundance of silver carp that is crushing the population of the Illinois River’s native fish, which rely on the same plankton forage as the carp. The growth of gizzard shad, an important forage fish in the river, has been reduced since the population expansion of Asian carp; similarly, the growth of bigmouth buffalo, a commercially harvested species, has declined. If Asian carp become abundant in the Great Lakes, we can expect similar effects on forage fish—such as rainbow smelt and alewife, two species that are important prey for Great Lakes salmon—that underpin the economically valuable salmon fishery. Loss of or significant change in the salmon fishery could adversely affect tourism in the Great Lakes coastal regions. Since 1995, five bighead carp have been captured in Lake Erie. In their 2005 analysis, the USGS identified eight tributaries in Lake Erie with over sixty miles of open channel that could serve as spawning habitat for these fish; yet to date there has been no evidence of reproduction. Of course, the presence or introduction of a few individuals is no guarantee that the bighead carp will establish a breeding population in the Great Lakes. But keeping their numbers low is an important step in controlling these prolific fish. One device that keeps Asian carp out of the Great Lakes is the electric barrier in the Chicago Sanitary and Ship Canal, the the southern gateway to Lake Michigan and central waterway that connects the Great Lakes and Mississippi River basins. Like an underwater electric fence, this DC (direct current) barrier makes fish uncomfortable, causing them to retreat back the way they came. It is really a two-way barrier: it helps prevent Great Lakes species from moving downstream into the Mississippi River and keeps Mississippi River species from moving up into the Great Lakes. But the electric barrier is not a permanent solution. Since originally constructed, the system has suffered power losses and reductions in use due to lightning strikes, maintenance operations, and changes in the overall electric conductivity of the water in the canal. Even with back-up generators at the ready, it isn’t a perfect system. We must recognize that the electric barrier—or other “barriers” that rely on a specific behavioral response of an organism—are merely short-term options in the battle to prevent non-native species from crossing between these two great aquatic ecosystems. This being said, we have already found Asian carp eDNA in Lake Michigan. Like the DNA you hear about in CSI: Miami, eDNA is genetic material that is shed from the cells of fish or other aquatic organisms and collected from the water. Using the eDNA signature, scientists can identify the presence of a particular aquatic species in a body of water. The eDNA process has been used for the past twenty years to track marine mammals (in lieu of taking a tissue sample); more recently it was used to detect the presence of invasive bull frogs in western U.S. ponds. While the eDNA process used with bighead and silver carp does not indicate if the same carp returns to an area over time, it is capable of detecting very low numbers—much lower than can be detected using traditional sampling gear such as nets or electro-fishing—of either species in a particular waterway. In fact, the single bighead carp that was recently captured in Lake Calumet—the product of thousands of man-hours of netting and electrofishing—had already been identified through multiple positive eDNA tests in the same general area of the waterway. While the simple presence-absence response from an e-DNA test is an important early warning for fish managers, hopefully scientists will over time refine the test to estimate actual fish abundance from the strength of the eDNA genetic signal. Stepping up and refining eDNA testing is a good idea, and we need big ideas and no small measures to keep invasive Asian carp from entering and becoming established in our waterways. We have never succeeded in eliminating an invasive species from the Great Lakes. To control—or even manage—Asian carp if they become established in the Great Lakes, will be difficult if not impossible. The closest analog to this is our work with another invasive species, the parasitic sea lamprey. Sea lampreys attach to fish with a sucking disk and sharp teeth and then feed on bodily fluids, resulting in wounds or eventual death to the host. Each sea lamprey will kill up to forty pounds of fish during its free-swimming parasitic life stage. Sea lampreys invaded the lower Great Lakes in the late-1800s and early-1900s. They eventually reached the upper Great Lakes in the mid- to late-1930s, where they forever altered the food web of the region by decimating native lake trout, the lakes’ top predator fish. Today, the upper Great Lakes are stocked with salmon and hatchery-reared lake trout, and we manage and control sea lamprey abundance at an annual cost of about $19 million. The Great Lakes Fishery Commission (GLFC), formed in 1955, is responsible for controlling sea lamprey abundance in the Great Lakes. In 1959, scientists developed a toxin called 3-trifluoromethyl-4-nitrophenol (TFM) or “lampreycide” that primarily affects lamprey but also affects other cartilaginous fish like sturgeon. This chemical is applied to streams in the springtime where larval lampreys live. Use of TFM over the past few decades has reduced the sea lamprey population by 90%. The GLFC also uses a program of sterile male release as well as barriers in streams to control the sea lamprey population, and they are investigating use of pheromones to attract adult lampreys. But we will never altogether eliminate the sea lamprey from the Great Lakes, and they will continue to affect many sport and commercial fisheries. While the sea lamprey control program illustrates that there are ways to successfully combat invasive species, it also shows the ongoing costs of that battle. Perhaps the most important thing we learned from the sea lamprey is that our best option is to keep non-native species out of the Great Lakes. Period. To do so, however, requires perseverance and a multi-pronged effort. First, we need to reduce or eliminate the introduction of non-native species into the Great Lakes Basin. This means we must deal with more than the fish and other free-swimming aquatic organisms already loose in the wild. We must work with the online and local nursery and water garden industries to alert buyers, wholesalers, and retailers to the risk of purchasing and introducing non-native plants—not to mention hitchhiking organisms. Second, we need to find and implement effective boat ballast water treatment procedures to prevent the introduction of organisms in retained ballast water. The U.S. Coast Guard currently regulates and inspects vessels coming to the U.S. from foreign ports and requires them to exchange their ballast at sea or to treat the ballast water prior to discharge in the Great Lakes. There are also ballast water restrictions in place on the Chicago Sanitary and Ship Canal as well as other commercial waterways to prevent the movement of aquatic organisms by the shipping industry. Michigan Canal in 1858 and later by the larger and deeper Chicago Sanitary and Ship Canal and the Cal-Sag Channel around 1910. Historically, these canals provided a means for settlers—and later commercial barges—to move west from Chicago via the Illinois and Mississippi Rivers. The canals were also a way to separate Chicago’s sanitary effluent from Lake Michigan, the city’s source of drinking water. Today these aquatic arteries still allow Chicago to flush its waste away from Lake Michigan and to move vast tonnages of cargo and large numbers of passenger vessels into and out of the Chicago region. Simply closing the locks near Navy Pier and farther south near Lake Calumet would bring economic hardship to the many Midwest industries that rely on the waterways’ commercial navigation to transport construction materials, chemicals, energy, and agricultural products. This is not a reasonable option. Separating the Great Lakes Basin from the Mississippi River Basin will be complex. It is not an impossible task, but it will likely be expensive. The solution will have to address all the services the system currently provides: commercial and recreational navigation as well as storm and wastewater conveyance. Ideally, an engineered solution will address all these societal needs and will no longer rely on organism behavior to protect our nation’s two largest ecosystems. Philip B. Moy has been the Fisheries and Nonindigenous Species Specialist for the University of Wisconsin Sea Grant Institute since 1999. Based in the Manitowoc field office, Moy works with Great Lakes anglers as well as inland lake groups to provide public information about aquatic invasive species.